Venice Is Sinking is arguably my favorite Athens band these days. Their music is a multi-layered post-rock with heavy emphasis on melody and unique instrumentation. Their songs do not rock out, but they do move the listener in a deep way. They remind me a lot of My Latest Novel or A Northern Chorus -- that brand of post-rock. Sand & Lines is their third full-length record. They chose to record it "live" in the Georgia Theatre in Athens, which is a big old building with a room designed for natural acoustics. Or, rather, it was such a place. Venice Is Sinking recorded there in May of 2008, and the theatre burnt down in June of 2009. 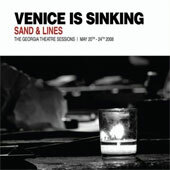 Venice Is Sinking has decided to donate their profits from this record to helping rebuild the theatre, which is a nice gesture on their part. The idea was to record the band playing in a room with natural reverberation, where the acoustics of the place would allow their instruments to echo in that unique way that they do in old buildings. And for that, it works great. The instruments here sound stunning. Dave Barbe did the recording, and he did a damned fine job. However, i cannot say the same for the voices. Specifically, violinist Karolyn Troupe’s voice is too light for the room. When she sings alone, as on Falls City the natural echo of the room makes her almost incomprehensible. I think this is part of the design of these old rooms. People used to design for voice or for music. That is, at the time the room of The Georgia Theatre was built, music was instrumental for the most part, and if people sang, they really projected. Ms. Troupe has a slightly meek voice, and that is fine for the type of music that Venice Is Sinking are doing, especially when amplified. However, the acoustics of the place demand that she belt out her words, like, say, Sharon Jones or Greta Morgan. She just isn't that type of vocalist, so what we end up hearing of her on this record is a sort of echoing murmur. The next tune is Tugboat, which has long been a personal favorite of mine. "I don't want to go to your party, I don't want to talk to your friends," Daniel Lawson sings, and i know what he means. The guitar chimes along happily and Troupe adds some nice harmony while also adding a lovely . There is also a lovely trumpet bit courtesy of multi-instrumentalist James Sewell. I really love this type of simple pop music. Venice is Sinking Mix it up again, beginning the next tune with a faint almost ambient electronic warbling. Then a slow kick drum comes in, and they the viola. The Grey Line is a light post-rock song, driven by an underlying organ riff. This is a lovely light song. The organ drone continues in Lucky Lady, here accompanied by brushed drums and a jaunty little guitar riff. This is a fun tune, and ends with a bit more of the stage banter. Here, the band discusses the need for some one to bring "some bottles" of scotch onto the stage... I suspect there is some exaggeration of their alcoholism here, but you can never be sure. Presumably starting at a drunken lurch, Falls City kicks off with an organ drone and an ominous drum riff. The guitar here is deep in that "wild west" sort of way that Myssouri used to do so well. Pebble Hill is one of the most active songs here, the drummer really cutting loose for a change, and the pace a step up from the "amble" that defines most of their music. Bound By Violets features a really nice chiming bell sound used here. I wonder, is that a sample, did they have a big church bell with them, or did they time their recording to catch a nearby bell chiming? Whatever -- it really works in this song, which is another active one, and features some rare guitar distortion. This is a good rocker from Venice Is Sinking. Another long time live favorite is next. The song is called Bardstown Road but i have always called it "Waiting for the Bars to close" because it ends with the band all singing "You're not alone, waiting at home, for all the bars to close" over and over. This song is a slow waltz, and the rhythm is defined by foot stomps and shaken sleigh bells. It is a really beautiful tune, and the repetitive singing at the end reminds me of When We Were Wolves by My Latest Novel. Finally, the album wraps up with The Wurlitzer Prize (I Don't Want to Get Over You), which is a vaguely moping song with a soaring viola line (Brendan's Note: This is another cover; the original song is by Waylon Jennings.) A fitting end to the record. It is a short album, just under forty minutes. Quite honestly, it is over too soon. Yet another really engaging, beautiful record from a wonderful Athens band. They do not make it over to Atlanta too often, but i cannot urge you strongly enough to check them out when they do.